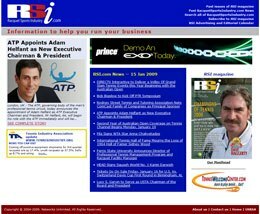 Racquet Sports Industry :: International Portfolio :: PRO IT Service S.R.L. - Choose a professional and accessible service for your online image! Racquet Sports Industry web master wanted me to code the Racquet Sports Industry new interface design and to develop this online magazine Web site based over movable type. The work involved coding the Racquet Sports Industry online magazine new interface in Web page format, to install movable type and code the Web site around this publishing platform, as well as host it under our movable type professional facilities. At the begging of February, 2007 the Greg Raven, web master at United States Racquet Stringers Association, came to me and asked for help on some custom fields his movable type v3.x implementation was using. They were having a movable type technical guy on their team which left the boat and so they ended up with difficulties on upgrading to a new movable type release due to the hacks that movable type guy applied directly to the application. I've helped Greg fix the issue he had and since he and his colleagues liked the work that I've done, a few days later Greg proposed me to work on a Web site project for him. The project was actually for the Racquet Sports Industry online magazine. He just had an interface design in graphical format that he wanted transformed in a real Web site backed on movable type. My assignment on this project was to slice the design in xhtml v1.0 transitional and css v2.1, in table less format, compatible across any platform combination and optimized for search engines, then to setup his domain under one of my company hosting servers rented from Pair Networks Inc., install movable type and then develop the required movable type section to fulfill the Web site publishing requirements. Since the Racquet Sports Industry Web site was meant to have a couple of distinctly managed content, I've proposed the client to split the project in three sections as three separate blogs and to nicely integrate them together so that basically the end user won't notice anything, while these sections would behave just as the customer wanted them to. Since then, we've occasionally implemented various other extra features, such as LightBox integration for people to be able to nicely see full screen photos when clicking on their thumbnails on site, such as different ads displayed randomly and more. We've also continuously upgraded the movable type installation any time a new version was available. I am going to show you below two screen captures, one for the Racquet Sports Industry main page and another for an individual article Web page. For seeing the Web site consider going to www.racquetsportsindustry.com. Contracting from U.S. Racquet Stringers Association, Vista, California, U.S.A.